Evidence has been found of a Roman rubbish pit dating from around ad300. Most of the cultivated land here had been enclosed by the latter part of the 16th century. A common field called Sheveshill lay near the site of the tube station and disap­peared sometime around the 1830s, when a workhouse for 350 inmates was built at Redhill. A union school for 150 children was added in 1859 and houses went up in North, South, and East Roads soon after­wards, presumably to serve the workhouse. The workhouse infirmary has since evolved to become Edgware community hospital. A farmhouse was built to the south – and it still had a cow-keeper in 1922. Burnt Oak remained predom­in­antly rural until 1924 when the London Underground station opened and the London County Council bought land to build 4,000 homes. The first Tesco super­market opened in 1929 in Burnt Oak, although founder Jack Cohen had already been selling groceries in the markets of east London for a decade. The Watling estate was complete by 1930 and included good provision of green spaces but a variety of other amenities were not made available until later. Private companies then built on the estate’s perimeter, notably the Sheffield-based firm Henry Boot and Son, which developed the site of Burnt Oak Farm after 1930. Many residents found employment at the de Havilland aircraft works in Stag Lane (see also Queensbury). Over the second half of the 20th century houses and flats replaced many commercial premises and the old Redhill hospital buildings. 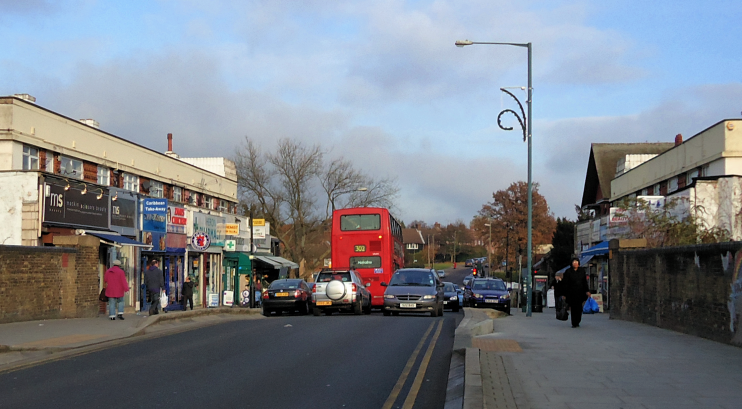 On almost every index of deprivation, Burnt Oak ranks the highest in the borough and it is the most densely populated. As a consequence, Barnet council has targeted the locality for numerous regen­er­ation efforts. The ward also has the borough’s highest proportion of disabled people and relat­ively large numbers of white Irish and eastern European residents, as well as those of Indian and African descent. At 33.7 years, the average age of Burnt Oak residents is relat­ively low, mainly because of the large number of house­holds with children, including many single-parent house­holds. * The picture of Watling Avenue, Burnt Oak, on this page is adapted from an original photograph, copyright Stacey Harris, at Geograph Britain and Ireland, made available under the Attribution-ShareAlike 2.0 Generic Licence. Any subsequent reuse is hereby freely permitted under the terms of that licence.